A rare swan decoy carved by Oliver Lawson sold for $10,000 at an auction of the John Maddox collection at Guyette, Schmidt & Deeter in Virginia on September 21-22. 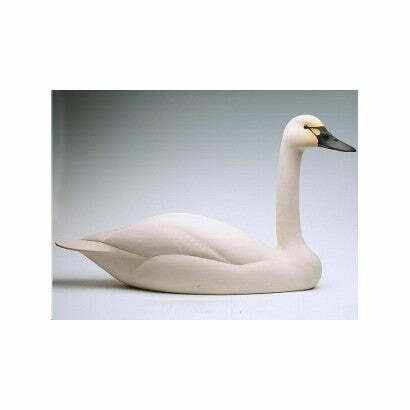 The full size swan was made by Lawson, a master carver of waterfowl, in 1986. It features relief wing carving and subtle feather paint detail. Previous works by the carver have sold for up to $3,000 - making this latest sale a record price paid for a piece of his work. A unique display of 12 dowitchers mounted on a coral base made $5,250, while a horse-drawn hunting carriage with gun boxes and a dog cage circa 1900 made $9,000. While decoys are relatively unknown in the UK, they often change hands for large sums in the US. They are used in hunting to attract ducks, and are designed to be as true to life as possible. The decoys collection is one of the largest in the US and is comprised of 5,000 unique pieces, 297 of which were sold at the auction. It was amassed over many years by John Maddox, founder of the Chincoteague Refuge Museum in Virginia. AE Crowell (1852-1952), a duck carver from Massachusetts, holds the current record auction price for a duck decoy. His preening pintail drake and Canadian goose each sold for $1.1m in 2007. For more information on duck decoys please click here.